Geoff Dodge is Chief Growth Officer at PebblePost and oversees sales, customer success and marketing as the company grows its footprint and solution set for brands across verticals. Geoff is a seasoned sales and marketing executive with experience in offline media, SaaS based CRM, digital advertising and analytics technology. Prior to PebblePost, Geoff was Head of Sales Productivity at AOL and responsible for building the sales enablement and training organization to support the media sales, platform sales, and account management. He also led AOL’s initiative to reconstruct a global CRM system. 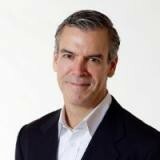 Geoff joined AOL after two years as EVP of Sales and Marketing at Demand Side Platform, DataXu. From 2007 to 2011 he was with SaaS platform pioneer Salesforce.com as Senior Vice President of The Media and Communications vertical team. Before his move into technology, Geoff served in a number of leadership roles in the media industry, including Senior Vice President and Publisher of BusinessWeek, CEO of MediaSpace Solutions, and Publisher of Time Inc.’s Money Magazine. He holds a B.S. in Management from Babson College.